MULTAN, Jan 29 (APP)::Punjab Chief Minister Sardar Usman Buzdar on Tuesday said that protection of people’s life and property was duty of the police. He expressed these views at a passing out parade of 1147 constables at Police Training Institute here. “Nothing is precious than human life. The police not only perform duties, but they also earn virtue by serving the masses,” he remarked. The CM said human life and its sanctity was supreme, adding that teaching of Islamic forbid undue killing of people even in wars. He expressed satisfaction over passing out of educated youngsters from the training institute. He hoped that these youngsters would serve the people in amicable way. He also lauded induction of new syllabus in training course, which aimed at imparting legal, moral education and improve character building. Protection of people’s lives and properties was top priority of the police, Buzdar said and also wished that Punjab police should be model force for other provinces too. He stated that cooperation of masses towards police was also vital. However, the police will have to bring change in its attitude to seek cooperation from masses. Police should give due respect to the people in police stations, he maintained. 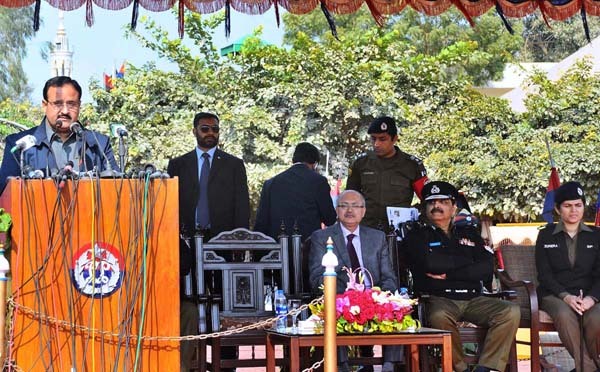 Inspector General Police Amjid Javed Saleemi also addressed the ceremony. He said that the constables were provided training on modern trends. An immense focus was given on character building of the constables so that they could serve people in excellent way. The trainers tried their best to provide conceptual training to the constables. He thanked the chief minister for upgrading the status of the institute to college level. He also underlined the need for establishment of the police colleges in Sahiwal and Raheem Yar Khan. He said that among passing out constables, eight were post graduate, 96 graduate, 618 intermediate and 425 were matric. Similarly, 638 passing out constables belonged to Dera Ghazi Khan, 180 Bahawalpur, 131 Multan and 198 from Faisalabad divisions.